Who I am not is below. To read more about the site and the philosphy, at least what I've left off in this section, check out my about this site page. As you've probably seen my name is Jeff Spielvogel. I am an American who grew up in North Carolina. After a couple of years studying in New Mexico I made my way back home to N.C. to finish my studies at the University of North Carolina with a degree in Middle Eastern and European History as well as Spanish. I spent several years running my own business and then joined a local catalog company where I worked as the Director of Internet Marketing. The job involved long hours, although with great people, and I began to put some roots down in my home state. Still, I wanted a new challenge and had arrived at a point in my life where I realized that no matter where I went things somehow turned out ok. 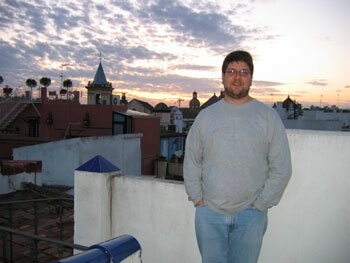 In 2003, with that bit of confidence, I packed up everything (and sold what I couldn't pack) and moved to Sevilla. I now live in Santa Catalina, a neighborhood in the center of Seville. I work with Sevilla5.com handling the hotel reservation business as well as web site marketing and development for other businesses in Seville. I also spend anywhere from 20-30 hours per week working on this site. If you're in Sevilla you may find me wandering around taking pictures and jotting down notes when not in the Sevilla5 office. You'll often find me with Markus in La Ojiva, or Javi's Bar as we call it, on Calle San Esteban. Well, the bar just changed owners, and I think we will need to find a new place for our "remote office". How did I come to know Sevilla? I first came to the city in 1989 to visit my sister and returned again in 1992 for her wedding. Like so many others I loved the place so much I wanted to return again and again. So I studied and lived here in 1993-94 and learned a lot from the student's point of view. For several years I annoyed my friends always talking about how I wanted to move to Spain one day. Not having the resources to do so I made several trips in 1996, 1997 and then twice in 2000, each time for about a month. In 2003 I finally saved enough money and worked up enough courage to come to Seville to live and see if I could "make it". So far things are going pretty well. How and why did I start this web site? I always wanted to start a web page about Spain, Andalucia or Sevilla but never found enough time to do it. When considering Spain as a topic for my page I ran into too many pages out there covering the whole country. Most seemed to offer a little of everything but missed the mark when considering the important details of each region. And while I had traveled to many of the provinces of Spain, I also missed a lot or did not have enough time to see it all. When considering Andalucia I came across a few pages who covered the region well, but often lacked the detailed information on Sevilla I would have liked to known when visiting. When I moved to to the city and began living off my savings (still using some of that money, but much less!) I decided to create a page about my life in Sevilla. I started out by adding my personal pictures and keeping a semi-daily diary so my friends and others could keep up with my life and understand why I decided to live in Sevilla. I began adding some other "useful" information to help those that might come visit me some day. I didn't want to create another page with dry, general tourist information and reviews of expensive restaurants and hotels - the only ones willing to pay money to these sites who live off of advertising money. There is little control over the validity of the information when a site lists any bar, restaurant or hotel willing to pay them. Many sites also seem to repeat everything in the off-the-shelf guide books you find in any store. Certainly there is a need for this information and it's very useful to take one of these books with you when you come to Sevilla. Certainly I have to make a living so advertising and services need to be offered for me to continue. But I feel an obligation to you, the reader and user of this site, in listing businesses and services which are not only useful but also ones I know, like and trust. I also feel you should be able to learn about the real Sevilla without buying a product or service from me. As I widen the scope of my page I do a lot of research and notice many sites and books list the same places. I also notice plenty of errors and omissions which are still out there today: One site mentions that people In Sevilla tend not to drink beer with their meals. That's news to me and I'm sure to many Sevillanos. A popular guide book mentions a certain restaurant where you should expect to pay 48E for a meal for two. Yet every time we eat at this restaurant we come away spending less than 30E. A local tourist magazine writes that it is custom to tip 10% in restaurants, hotels and taxis. I'm sure the local businesses appreciate this but it's just not true! Finally, another site mentions people in Sevilla seem to be angry with each other a lot, complains about the size and price of Coca-Cola served at restaurants as well as the lack of English channels in many hotel rooms. I won't bother to explain my problems with this one. Over time my site has grown and grown and become the uncontrollable beast it is today. But no matter what the changes I won't lose the personal style of the site. This is Sevilla through my eyes, and I don't expect everyone to agree 100% with my opinions or my advice. This information is what has worked and continues to work best for me and I am confident it will work well for a lot of you. Please remember I'm not an expert on it all and I'll happily point to another page when they cover a topic better than I can hope to. If you have questions, additions, or revisions I'm happy to receive your emails and will do my best to personally answer each one I receive. a web designer- don't tell me I am lacking skills in design. I'm already well aware of that. a writer - please keep your thoughts on my writing to yourself. Any mistakes were made with the best intentions. a photographer - I have a nice camera, I use auto focus 99.9% of the time. Most of the pictures here were taken with that camera or my new point and shoot digital camera. a Carolina fan, or for that matter a Terripans fan - I can at least respect the Heels, but Maryland? They "get no respect" after winning a title?? Please...if you are a turtles fan, I'm really sorry. Remember those 10 points in 59 seconds?